I once had the pleasure of meeting Stan Winston at the San Diego ComicCon. I told him I was a CG artist, but that I had enormous respect for practical effects artists. He told me he had no problem with CG, but that it was one tool of many, and not always the best choice. It was with this in mind that I created my entry for this contest. I wanted to create a robot by combining CG with real world objects. I got permission to take photographs in my local power plant, and modeled in Maya on top of these photos using polygon extrusion, then I used the same photos as textures, and assembled the parts into the shape of a spider. I then captured a real spider from my wife’s herb garden in a jar, and photographed the jar, then released the spider onto a leaf, photographed it, and combined the two images. 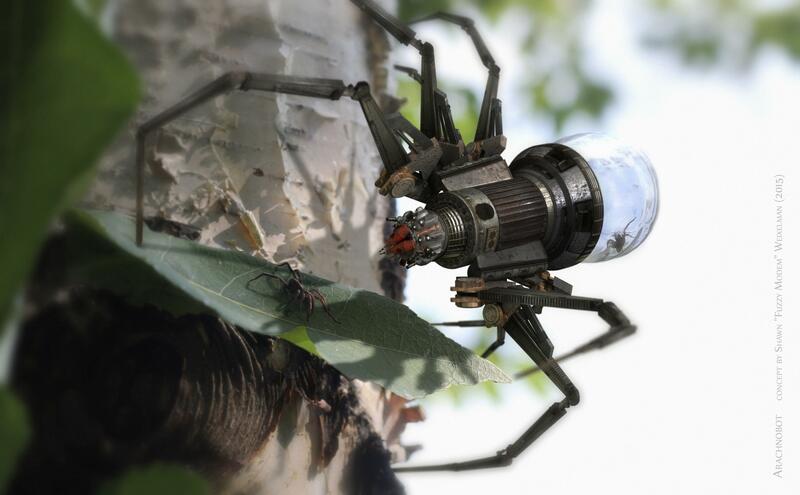 In Maya, I positioned my robotic spider to match the position of the real jar. Once rendered, I took the final image into Photoshop for compositing with the photo background. I wanted to create an image that told a story, and rewarded a second glance, while leaving much in the subtext, inviting imaginative extrapolation. I envision an eccentric arachnologist inventor, who created the robot to collect samples, but many of you will likely have a more interesting take. As we can enter the contest three times, I’ll keep a brain storm on the back burner and see if I can’t come up with another two ideas before the deadline. I look forward to following the competition, and seeing all the fantastic entries flow in from my fellow competitors. I like that you expand on the character and try and tell a story with the scene. And thanks for sharing the creative process as well. Great work! Hi Chris! Thanks I take it you are the contestant wrangler? Just let me know if you need any other info. Very interesting take on the piece you have. I was actually noticing details and had a similar type of story more or less. I was actually looking to see if there was a viable function to allow the spider bot to actually collect into the jar with your other spider. Aside from how it might happen I totally buy into the idea it could have actually been built. Hi Ian, yeah, there are three "airlocks" between the mouth and the jar, and the "fangs" are mounted on extending arms with tiny electrical prods to force the spider down it's "throat". Wow, You did actually have all that worked out sweet. Again my fanboy attitude would like to see more specs. So many toys, so little time, so many distractions from my own toys. Thanks for the vid, I love the detail even down to the metal looking used and exposed to the elements. I really need to up my game feeling so inadequate. lol. Yeah, the textures turned out pretty nice. The power plant where I took the photos is getting ready to be torn down and replaced. I was fortunate to be allowed in to photograph all the old equipment. Really fun to see all the great entries rolling in! Thanks Tristan. I'm pretty happy with it.